The Wards Corner Public Art is scheduled to be installed on April 30! Gordon Huether Studio, led by artist and founder Gordon Huether, was selected to design and fabricate a public art installation for the Wards Corner neighborhood. 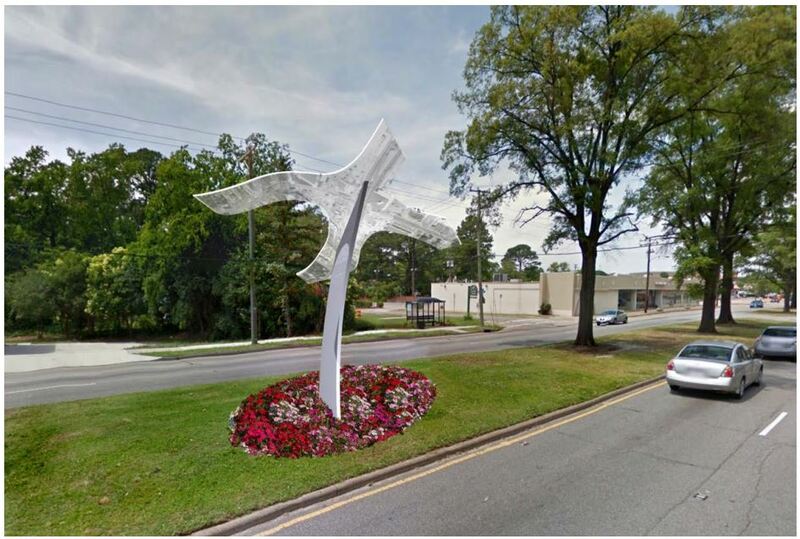 The sculpture, Wards Corner Gateway, will be installed on the median on Granby St., near North Shore Rd. on April 30, 2015. The City of Norfolk’s Public Art Program worked with Gordon Huether Studios to develop a concept that embraces local identity, fosters a strong sense of place and creates a significant gateway for the City of Norfolk. The installation enables all viewers, whether local or visiting, an opportunity to pause and reflect about the continued positive and exciting changes taking place in the neighborhood. The Wards Corner Gateway installation is made up of two components: a bird-like structure inspired by the famed intersection where Alfred C. Ward once operated his iconic general store, and a polished aluminum base. The large wing-like component, features a black and white aerial photograph of the Wards Corner intersection and was taken by a staff member of the Virginian Pilot in 1956. This part of the installation is made of translucent polycarbonate material. The wing-like component is then mounted atop an eleven-foot tall aluminum base, which causes the ‘Wing’ to point toward the sky. Wards Corner Gateway will be illuminated at night, featuring programmable color-changing lighting. The installation and its upward orientation references this neighborhood’s future: its continued upward growth and development in cultural, economic and community matters. This entry was posted on Wednesday, April 29th, 2015 at 4:25 pm and is filed under Uncategorized. You can follow any responses to this entry through the RSS 2.0 feed. Both comments and pings are currently closed. I thought that the remodeled Wards Corner looked so nice. Like they were serious about making the area a premium spot. Then, with a third mattress store in front of the shopping center – ugly brown building and with bright red canopies. Could it have gotten any worse!! Looks like a bad joke. What were they thinking ….. or were they thinking at all ? The new mattress store is on privately owned land and being developed by a private developer. The City has no ownership interest and no control over what is built there. Really? The city of Norfolk gets its nose in everything happening here. They probably didn’t care because it wasn’t in Downtown Norfolk. They are happy it looks like a joke, because it makes the downtown area more attractive. you would think that changing for a gas station rezoning had to take place. the building is so close to little creek rd. somebody had to give up something, they could have matched the background buildings with color and awnings atleast. But the bigger problem is how nasty and dirty the autozone strip area is.